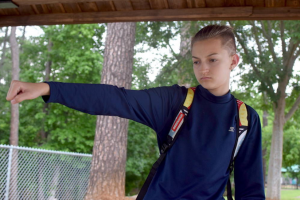 LAWRENCEVILLE, GEORGIA, UNITED STATES, March 8, 2019 /EINPresswire.com/ -- Backpack Kid Russell Horning1 has developed a worldwide reputation for quality entertainment thanks to his iconic look and his wacky choreography. Recently, he was invited to perform at the UniverSoul Circus in Atlanta to showcase his famous moves and participate in a one-of-a-kind show. Russell Horning2 (known around the world by his creative title “Backpack Kid”) has always had a knack for dancing, but it’s only been in the last few years that he’s shared his memorable moves with an international audience. He loves to dance, and he didn’t think anything of posting a clip of his wacky new dance with a few friends and family members online. However, because he shared that video, the world now knows and loves the famous “flossing” dance. A social media trendsetter initially picked up on his entertaining choreography and shared it with hundreds of thousands of his online fans. After, superstars like Rihanna and Katy Perry viewed his videos, and the latter even invited him onto the SNL stage to perform his flossing dance in front of the millions of viewers tuning in for her performance. Backpack Kid’s fame has only grown since then with his flossing dance taking the world by storm. Recently, he was asked to perform at the famous UniverSoul Circus in Atlanta, GA, a provider of top-notch entertainment. The UniverSoul Circus was established as a single ring circus by Cedric Walker in 1994 with the vision to present a world-class circus featuring a large percentage of people of color. Mr. Walker searched the world over to find only the best talent to present in his show, and the UniverSoul Circus currently features performers from at least 24 different countries. Cedric Walker began recruiting and training his circus team in 1993, preparing for a production season that would begin the very next year. His first performance took place in 1994 and was initially held in the parking lot of the Atlanta Fulton County Stadium. After a rocky financial start, the circus grew to 10 cities in 1997. By 2005, the UniverSoul Circus had performed in 32 cities across America and already completed its first international tour in South Arica. The circus often invites famous guests to perform alongside the crew at UniverSoul, and extended an invitation to Backpack Kid for a special performance (featuring Lavaado) this past February. There, he showcased his talent and performed the legendary floss alongside ecstatic members of the crowd.